I bet you thought that if you’ve seen one deerfly, you’ve seen them all, right? Would it surprise you, then, to learn that there are some 100 species of deerfly in North America alone? Of course, when they’re swirling about your head it’s hard to tell one from another, and you’re probably not looking too closely at them after you’ve squished them, either. You can buy “deer fly patches” in outdoor-recreation supply stores, found in the same aisle as the bug spray, and these are great tools for examining deerflies more closely. They function like double-sided duct-tape, with one side affixed to the back of your cap where the deerflies like to land, and the exposed side flesh-coloured to attract the bugs (who naturally target the back of the head, where it’s harder for animals to smack them). Of course, they’re designed primarily with bug-relief in mind, but that doesn’t mean you can’t apply your entomological curiosity to the catch, too. I first noticed that not all of the deerflies landing on my deerfly patches looked the same while out doing MAPS last summer. Some days, when the bugs were really bad, we’d get upwards of 30 or 40 trapped on the patch over a morning. Dan topped out with around 85 crammed onto the thing at once, one particularly buggy day. With that many side-by-side you can really begin to notice the subtle differences. For instance, the top photo is of a very yellow individual with a yellow-and-black thorax and distinct black markings on the abdomen. The second photo, meanwhile, shows an individual with a grayish thorax and thick black markings on the abdomen. 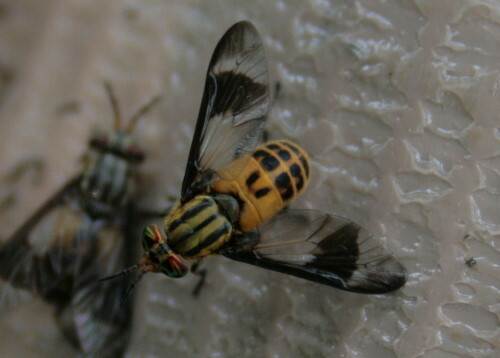 Some deerflies have iridescent-red eyes, while others have iridescent-green. Even size varies a little, with some individuals noticeably larger or smaller than others. Nearly all of them are contained in the genus Chrysops, and have the black bands on the wings, and a yellow abdomen with black markings. Last week at our Maplewood Bog MAPS site I discovered this very distinct deerfly stuck to Dan’s hat. I’d never seen one so dark before, so it caught my eye. Looking closer, I noticed it had fuzzy orange shoulders and bright red eyes. I stole Dan’s hat (temporarily) so I could get a few photos of it; it was too bad I only had my wide-angle lens with me, so I couldn’t get a crisp macro shot of it. I looked it up when I got home. 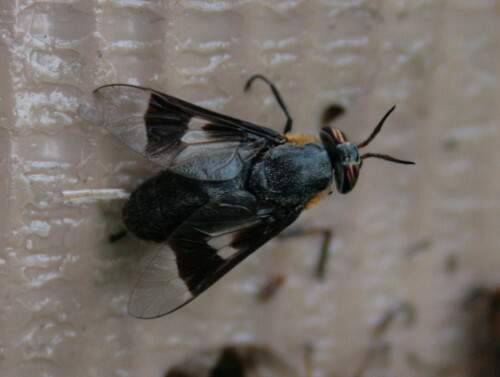 It was easy to find in BugGuide’s list of deerfly species, as it was the only one that was dark with orange shoulders. This is Chrysops cincticornis. BugGuide has ten photos of the species in their database, all of which are from Ontario and New England, and all of them taken in June. The page offers no information on the life history of the species, and I could find little else (at least in a quick search) on the web. The two pages with actual information indicated that they lay their eggs on certain species of rushes, sedges and grasses in groups of (on average) 215 eggs, and their main flight season in Maine is from the third week of June through the second week of July. Great minds… I posted on the related horse flies today. I’m glad I wasn’t out there on the 85 captures day! Both the deer flies and the horse flies have been bad this year. 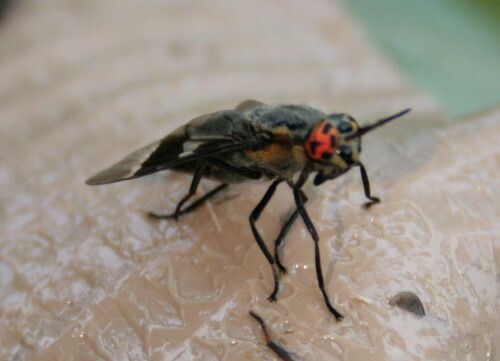 Hi there, I have been trying to find out what type of fly I was bitten by last week, in the Georgian Bay area – Eugenia falls. I have about 7 bites, all on my hands as I was holding my camera and taking pictures of the falls and the surrounding area. 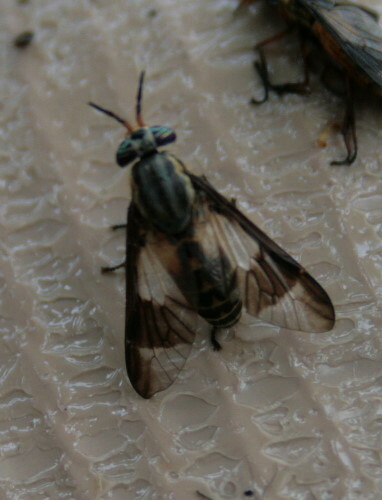 Based on your photos, and the information I found on BugGuide, they may have been deer flies. They were smaller than house flies, and more right angled triangular – and they had definite black marks on the wings. I am not sure why they went for my hands only – unless they really liked my black camera body??? It was very hot (35 deg C) and humid. The bites were initially tiny red spots, and by about 12 hrs later were larger, itchy, and raised.